© 2011 by The York Daily Record/Sunday News. 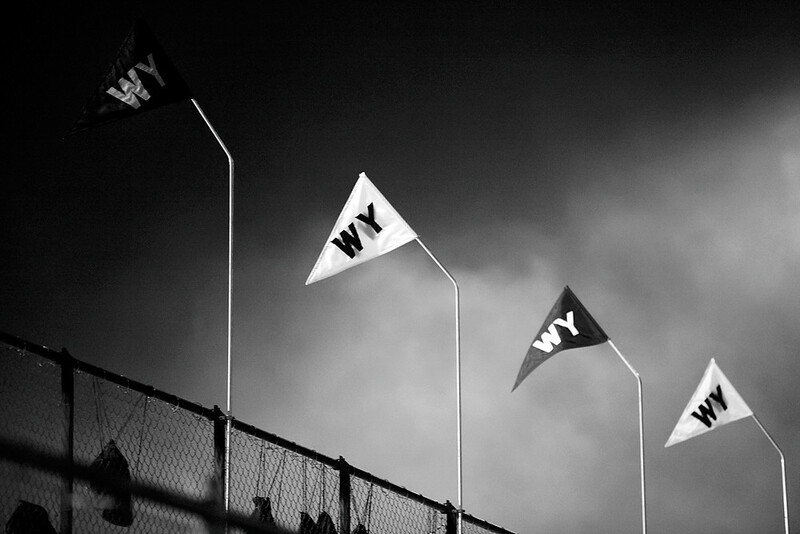 Last Friday, West York ended its 10-3 season with a loss that cut short the team’s hopes of playing the district championship final. But the Friday before that? Victory. I shot the game for the next day’s sports section, but I also shot outside the game for a monthly gallery feature that ran in Tuesday’s living section. Here are a few frames, which I did convert to black-and-white for this blog post. You can view all the photos, and read the brief, as they were published. © 2011 by The York Daily Record/Sunday News. 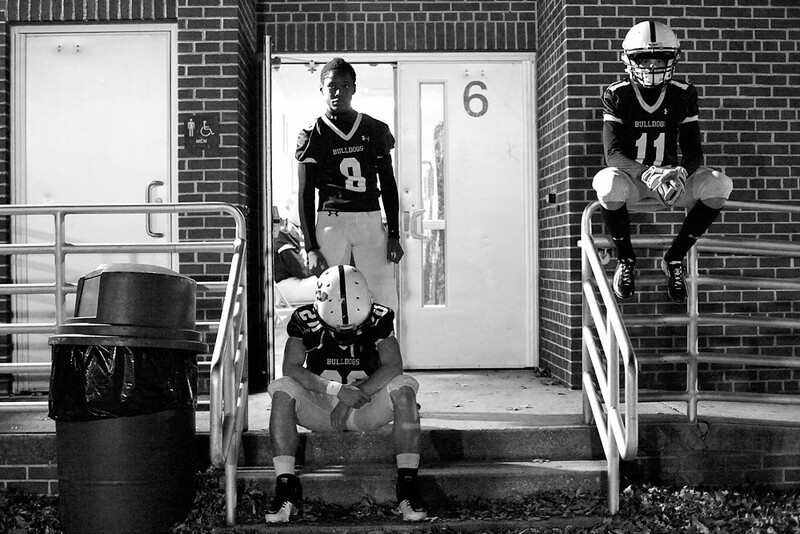 (Left to right) Head bowed, West York running back Brock Snellbaker sits on the steps outside West York Area High School as wide receivers C. Kingsley Chikezie and Ryan George (sitting on railing) wait for pregame warmups to begin before the PIAA District 3AAA quarterfinal game against Susquehanna Township at home on Friday, Nov. 18, 2011. West York defeated Susquehanna Township 42-14 at home on Friday, Nov. 18, 2011, to advance to the District 3AAA semifinal round. © 2011 by The York Daily Record/Sunday News. 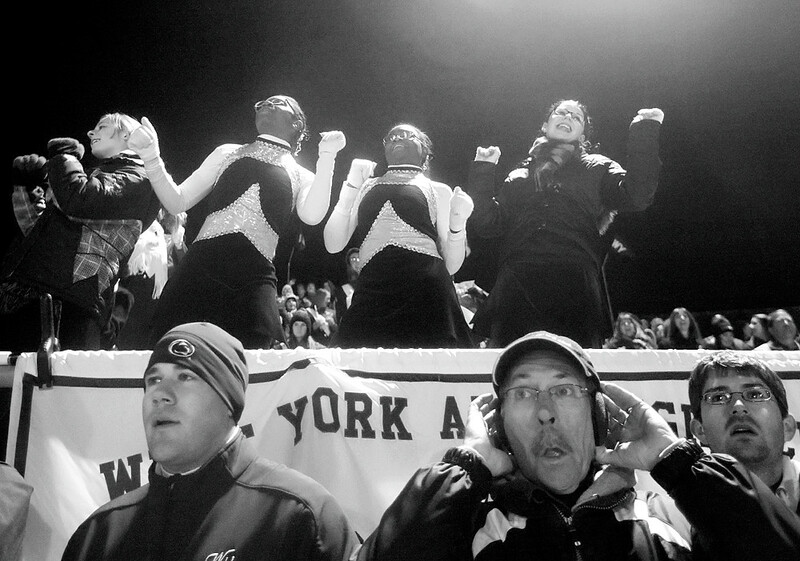 (Left to right, bottom) West York residents Brett Butler, Tom Eyster and Chris Eyster watch the game as West York eighth grader Emma Rikas and West York Bulldog Marching Band color guard members Daniela Ngounou, Ornella Ngounou and Maxine Stough cheer after a second-quarter West York touchdown during the PIAA District 3AAA quarterfinal game against Susquehanna Township on Friday, Nov. 18, 2011. © 2011 by The York Daily Record/Sunday News. 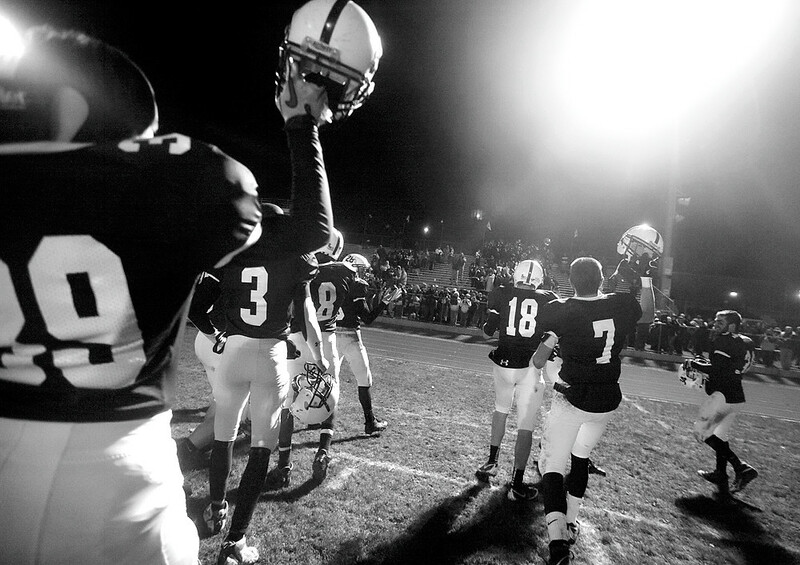 West York football players lift their helmets as they return to their home fans after defeating Susquehanna Township in the PIAA District 3AAA quarterfinal game on Friday, Nov. 18, 2011. © 2011 by The York Daily Record/Sunday News. 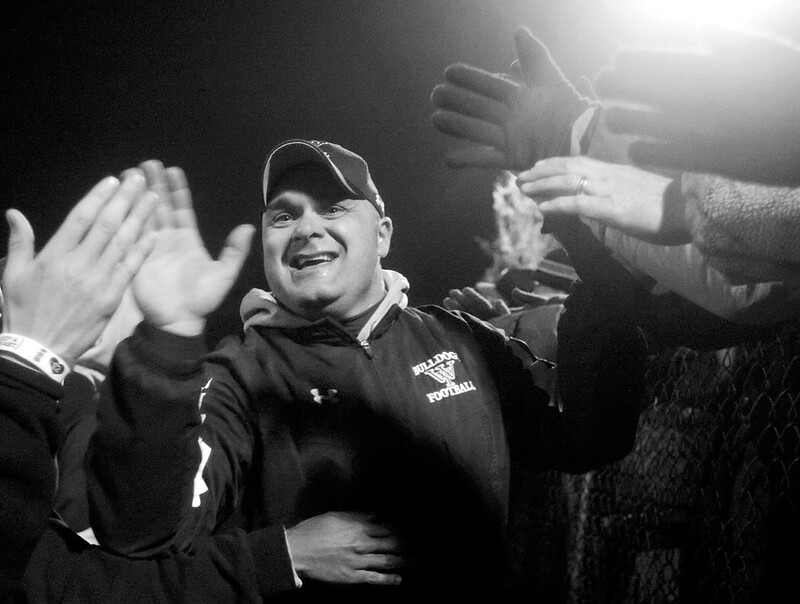 West York head coach Ron Miller gets high-fives from students and fans after the Bulldogs won the PIAA District 3AAA quarterfinal game against Susquehanna Township on Friday, Nov. 18, 2011. The first time I met Rebecca Moore, we were both out on the streets. She was doing her thing (speaking out against violence) and I was doing mine (photographing). © 2011 by The York Daily Record/Sunday News. 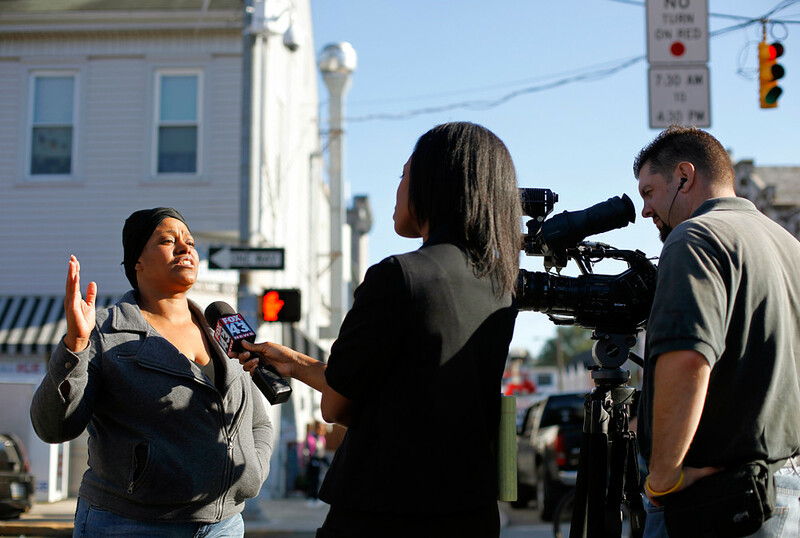 Community activist Rebecca Moore speaks to a Fox 43 reporter at a rally against crime at the intersection of West King and South West Streets on Thursday, Oct. 6, 2011. Joanne Borders, a community resource liaison with the York City police, organized the rally, which took place about four blocks from the area where a man was shot and robbed of his SUV on Wednesday, Oct. 5. Reporter Rebecca had already been in touch with Moore, for a Sunday centerpiece story about her acting out against gang activity in the Parkway neighborhood of York City. (According to York City police, the Parkway gang is one of the five most active gangs, out of 49 total gangs that have been documented in city limits over the past five years.) Rebecca introduced Moore to me, and later that night, we went to Moore’s house for the first time. Between daily assignments and over the next two weeks, I spent time with Moore — on a personal level, in her home, with her family, with just her. © 2011 by The York Daily Record/Sunday News. 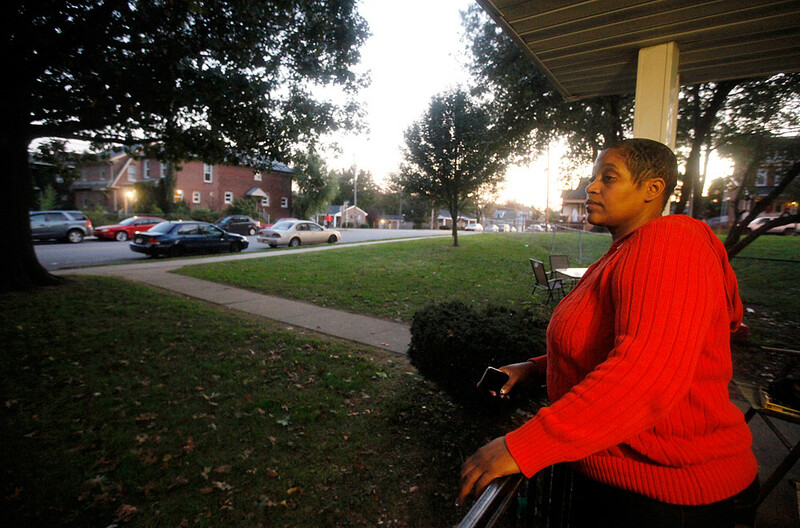 Community activist Rebecca Moore watches from her front porch as a car pulls up along the curb of Parkway Boulevard at dusk on Sunday, Oct. 16, 2011. Moore is a resident on Parkway Boulevard, where she has seen the level of crime and violence rise in the past six years. She has since formed Operation Stand Up - an organization that assists residents and police officers at crime scenes - and become an outspoken member of the community against the Parkway Gang's activities. © 2011 by The York Daily Record/Sunday News. A "No Trespassing" sign is one of several posted around the fringes of the Parkway neighborhood. 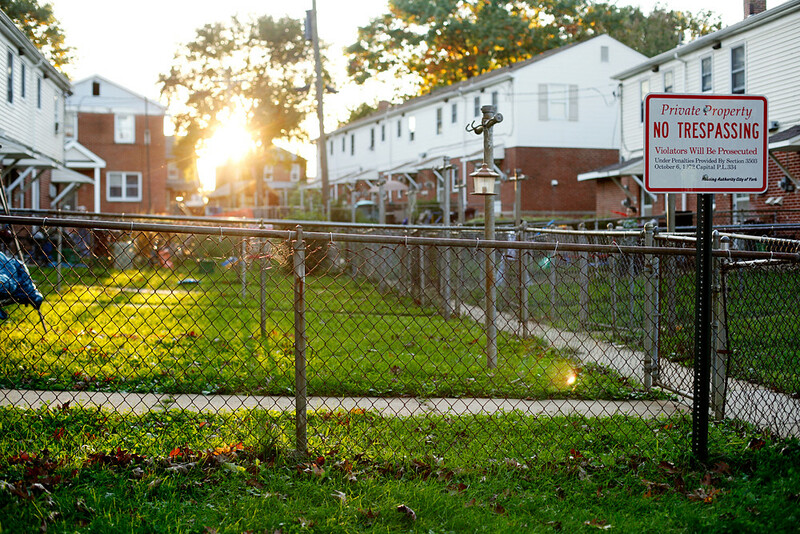 The neighborhood, which is owned by the York Housing Authority, is restricted only to residents and their guests, for whom residents are to be held accountable. …and I ended up spending the rest of the day with her and her family. © 2011 by The York Daily Record/Sunday News. 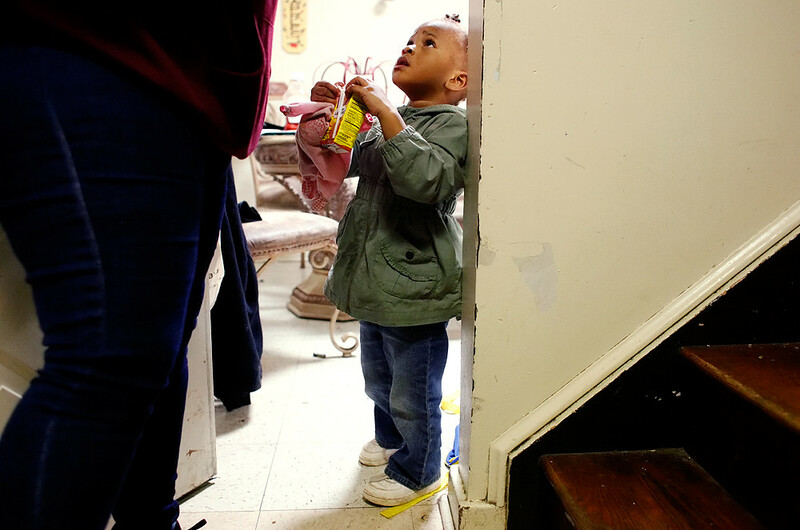 Tah'ryzma Holland, 3, looks up at her grandmother Rebecca Moore as Moore prepares to leave the house for a while on Saturday, Oct. 15, 2011. The girl, known as Nana to friends and family, and her father live with Moore on Parkway Boulevard. Nana calls Moore "Mommy" and gets separation anxiety whenever Moore leaves the house without her. When asked if she fears retaliation for her boldness, Moore said she is not afraid. When asked if she fears retaliation upon her loved ones, Moore said her loved ones are why she refuses to back down. I joined them again the next day — Sunday — for their weekly family dinner. © 2011 by The York Daily Record/Sunday News. 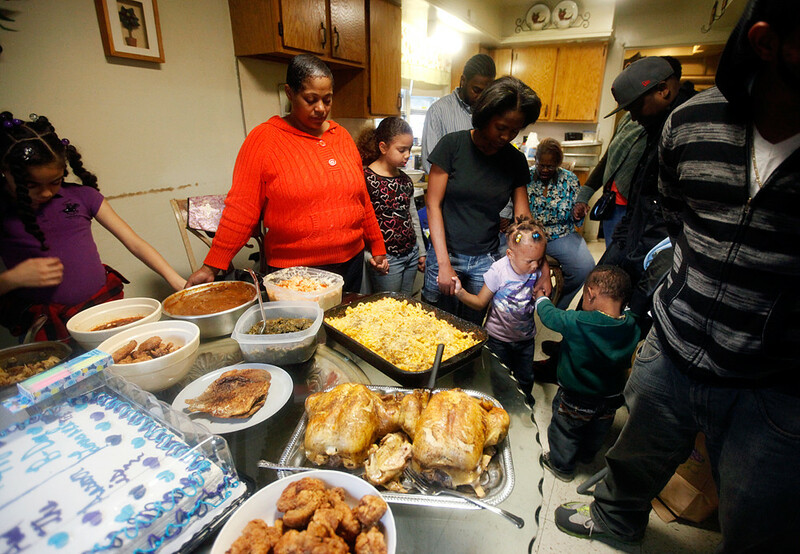 Community activist Rebecca Moore, in orange, and her family gather around a groaning table of food as her mother Mary Tyler, back and seated, says a prayer before the family dinner meal on Sunday, Oct. 16, 2011, at Moore's house. 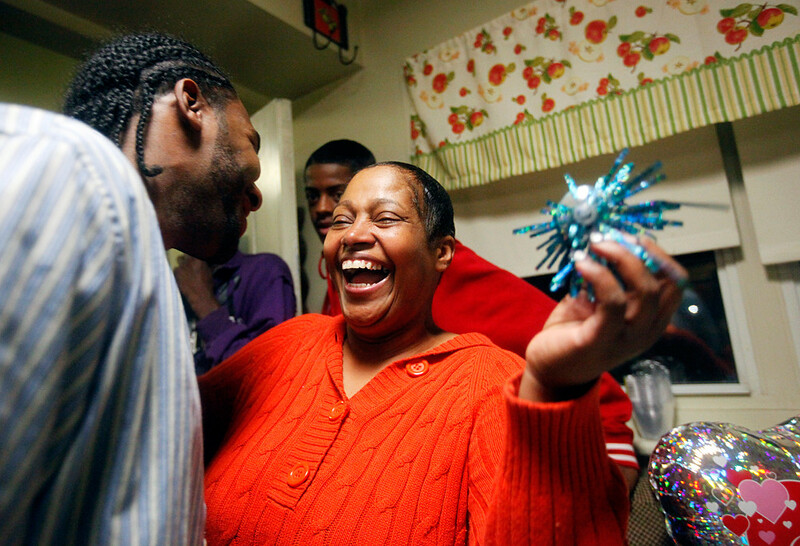 Every Sunday, members of Moore's family come to her house for family dinner, although attendance varies during the football season. It was a wonderful evening. The house filled up quickly with more family members and friends than I could keep track of, and Moore became engaged that night. © 2011 by The York Daily Record/Sunday News. Cake topper in hand, community activist Rebecca Moore surprises her new fiance Andy after she said yes on Sunday, Oct. 16, 2011, to his proposal for marriage the day before. Moore teased Andy by presenting him with a sheet cake with three toppers and telling him that two of the toppers said "no" and one topper said "yes" - and that whichever topper he picked would be her answer to his proposal. In fact, Moore had written "yes" on all three toppers. The story ran two Sundays ago, after being held for two Sundays because of the Penn State coverage. Be sure to check out Rebecca’s story for a lot more information about Moore, as well as for more photos. Today was the first day of rifled dear hunting season, so yesterday, the paper ran a story about Sunday hunting… which isn’t allowed in Pennsylvania. Really interesting story, with some interesting comments from our readers. © 2011 by The York Daily Record/Sunday News. 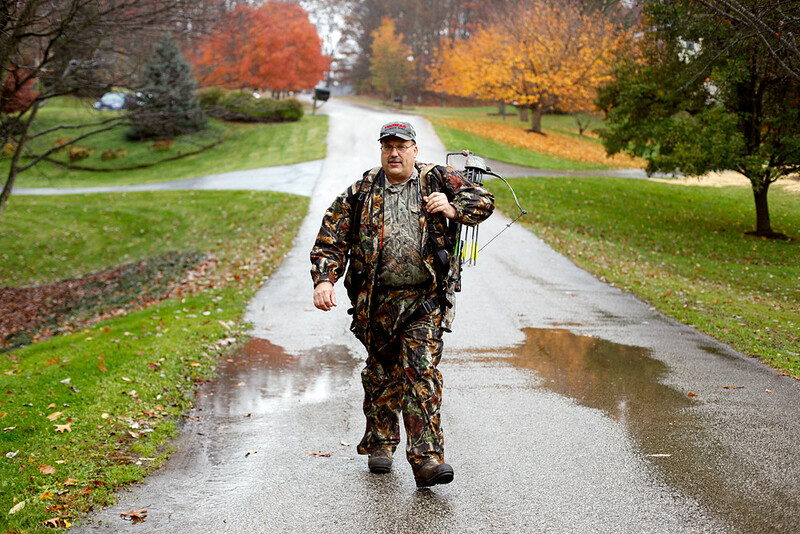 Dave Peterson of Shrewsbury walks down a rural cul-de-sac, at the end of which he is allowed to hunt, on Thursday, Nov. 10, 2011, in northern Baltimore County, Md. Under Pennsylvania law, hunting is not permitted on Sundays. Dave Peterson of Shrewsbury is licensed to hunt in both Pennsylvania and Maryland, and likes hunting in Maryland because of the state's fewer restrictions. © 2011 by The York Daily Record/Sunday News. 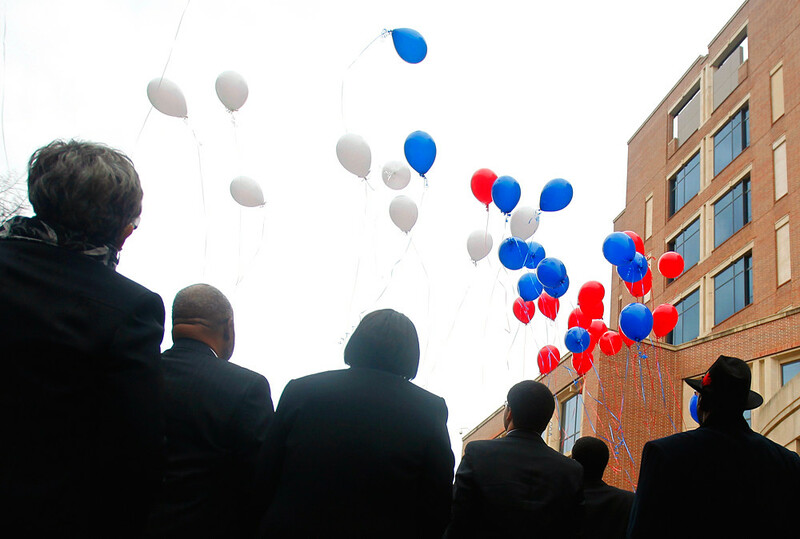 Friends and family of York County Judge Chuck Patterson watch as balloons they just released float up into the sky in front of the York County Judicial Center on Saturday, Nov. 26, 2011. The funeral procession for Patterson stopped briefly in front of the judicial center after the service, where a police officer played the bagpipes and a moment of silence was observed. Photographing a home team’s loss is always a little rough. But it’s rougher when the loss means the home team isn’t going to district championships. © 2011 by The York Daily Record/Sunday News. 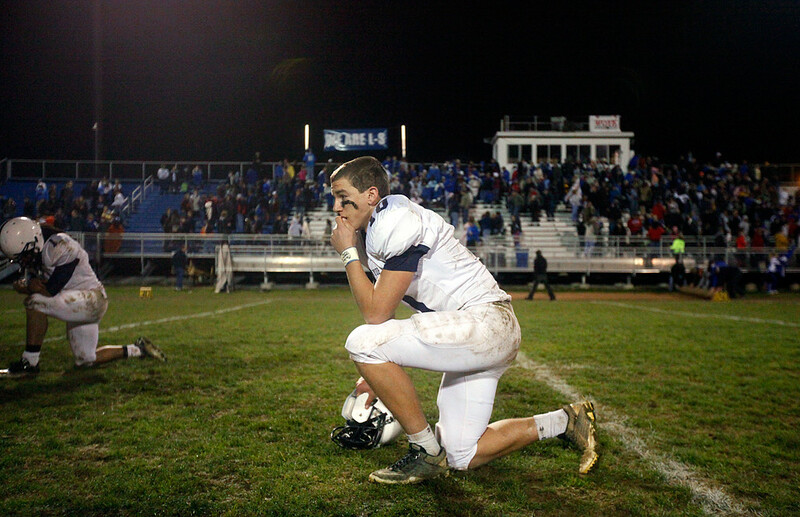 West York's Zack Smith kneels on the field before joining his teammates and coaches for a huddle after West York lost the PIAA District 3 Class AAA semifinal game on Friday, Nov. 25, 2011, at Lampeter-Strasburg High School. © 2011 by The York Daily Record/Sunday News. 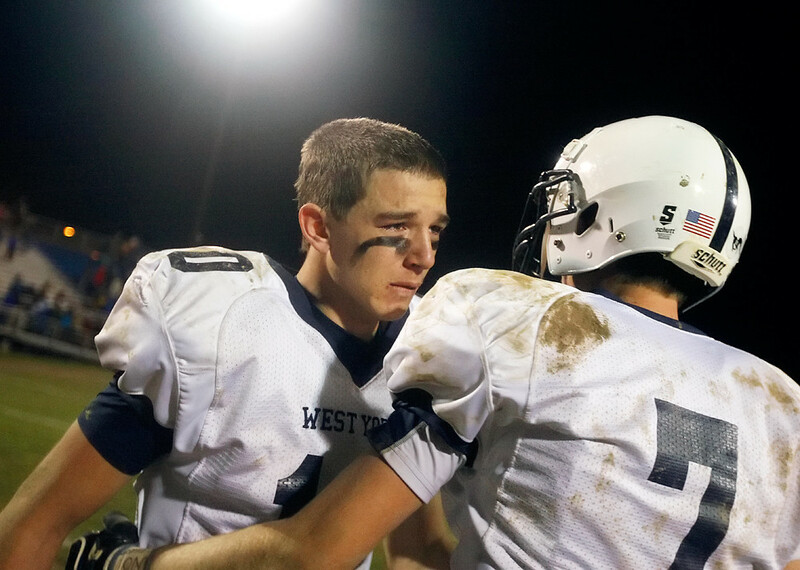 West York's Zack Smith and Brock Gladfelter take a moment after the PIAA District 3 Class AAA semifinal game on Friday, Nov. 25, 2011, at Lampeter-Strasburg High School. West York ended its 10-3 season with a 24-13 loss that cuts its path to the district championship game. I started work a little early yesterday after my editor texted me about “a guy holed up in [his house] with a firearm.” Turns out the neighborhood was no more than a mile (as the crow flies) from my apartment, deep in the heart of the suburbs. © 2011 by The York Daily Record/Sunday News. 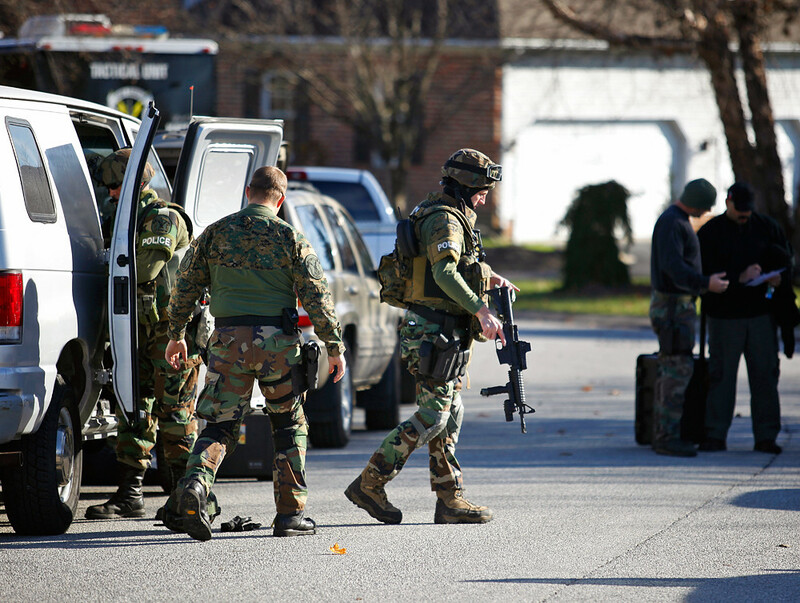 Members of the York County Quick Response Team arrive at the intersection of Chestnut Run Road and Primrose Lane, near the 2730 block of Chestnut Run, in response to an alleged hostage situation on Friday, Nov. 25, 2011. The standoff was not in fact a hostage situation, but rather a man alone in his home who fired off several gunshots and refused to exit his house in a nine-hour standoff. The man exited his home peacefully and was taken to Central Booking at 8:45 p.m. The initial call came in at 11:45 a.m. Reporter Mike and I arrived at about 12:30 p.m., and stayed until Rebecca relieved Mike and I had to leave for a 4 p.m. assignment. Read Mike and Rebecca’s report for more details. When the paper sent Lauren and me to State College two Fridays ago, it wasn’t just to cover the candlelight vigil and the season’s last home game/first game without Joe Paterno. Lauren is a business reporter, so as soon as we arrived in State College, we started working on a biz story: (How) have the Sandusky case and Paterno’s firing affected the Penn State brand? © 2011 by The York Daily Record/Sunday News. 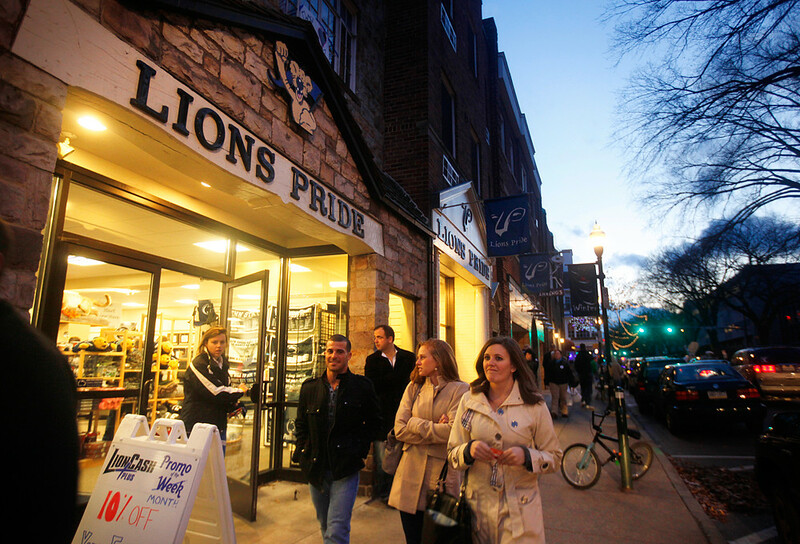 People walk out of and past Lions Pride - a Penn State merchandise store on East College Ave. in State College - at dusk on Friday, Nov. 11, 2011. The store continues to sell a high volume of branded merchandise even after former head coach Joe Paterno was abruptly fired days after one of his former assistants was charged with 40 counts of sexual abuse. The first store we walked into was Lions Pride. When the clerk fetched the store manager for us, he (the manager) scratched his head and said he wasn’t giving interviews because he knew what we wanted to talk about. He’d been turning down CNN, a few big-name papers and other outlets all week. But then he started talking anyway. And then he agreed to let us quote him, and take photos in his store. And, once I was done making photos, we approached him to thank him and give him our business cards — right as he was turning down another national media outlet on the phone. © 2011 by The York Daily Record/Sunday News. 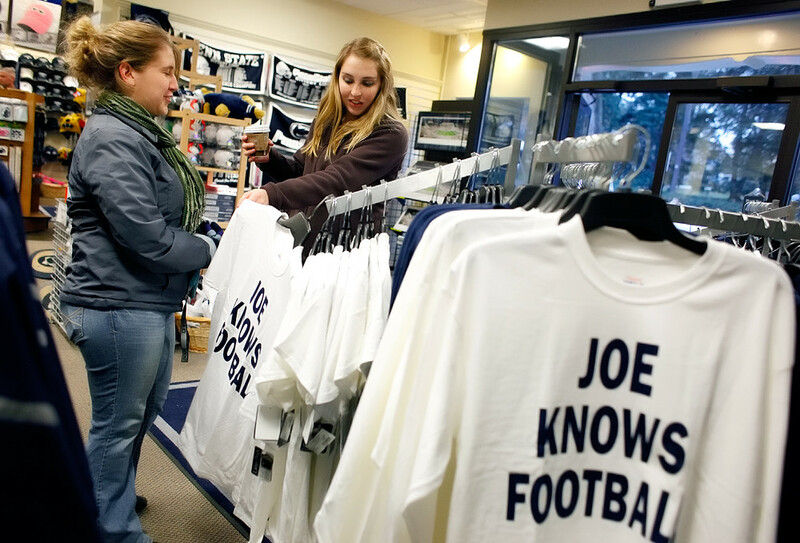 Penn State junior Autumn Sikora, left, checks out a "Joe Knows Football" T-shirt with fellow junior Lauren Owazany, both of Luzerne County, on Friday, Nov. 11, 2011, in Lions Pride in State College. Lauren and I went to several other stores afterward. No one else would talk to us. © 2011 by The York Daily Record/Sunday News. 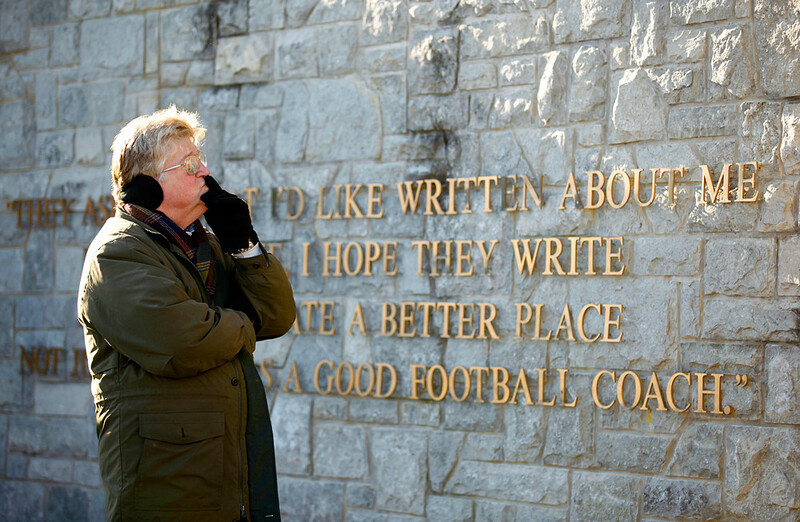 Tom Boyer of New Cumberland reads the plaques detailing the scores of games for which Joe Paterno was head coach, near the larger-than-life-sized Paterno statue outside Beaver Stadium, on Saturday, Nov. 12, 2011, before the game against Nebraska. In the Nittany Lions' first game in 46 seasons without former head coach Joe Paterno at the helm, Penn State hosted Nebraska at Beaver Stadium on Saturday, Nov. 12, 2011. …so I made the picture. © 2011 by The York Daily Record/Sunday News. 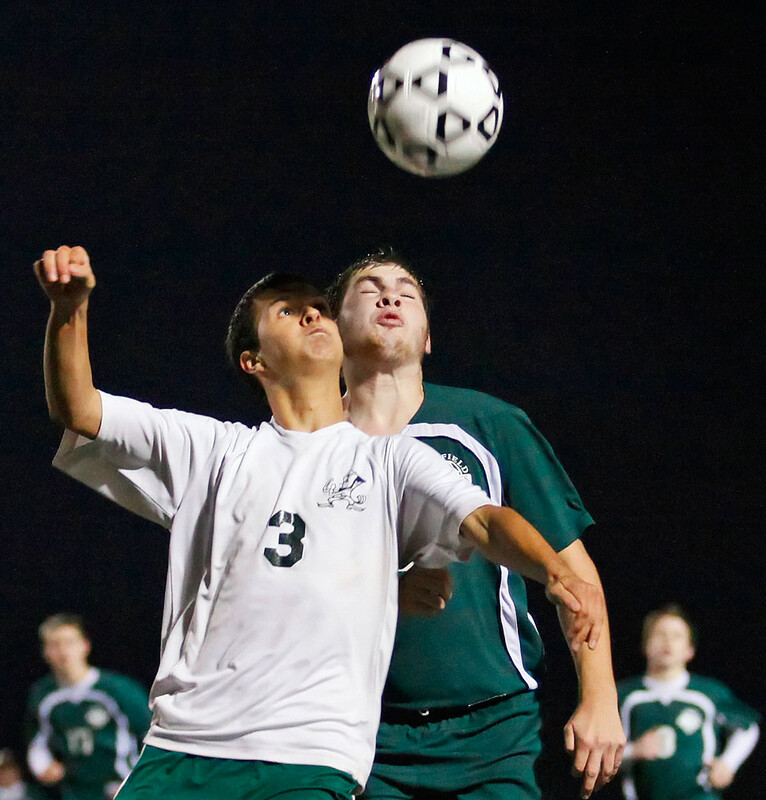 (Left to right) York Catholic's Chris Sosa and Fairfield's Chris Herl vie for the ball in the second half of the YAIAA Division 3 Class A boys soccer semifinals on Thursday, Nov. 3, 2011, at Northeastern High School. York Catholic defeated Fairfield 4-2 and went go on to the YAIAA Division 3 Class A boys soccer finals. * You can view the first photo, too. I’ve recently made a few pictures — each for different assignments — in which certain objects appear to be floating. I’d like to think that I’m magical. © 2011 by The York Daily Record/Sunday News. 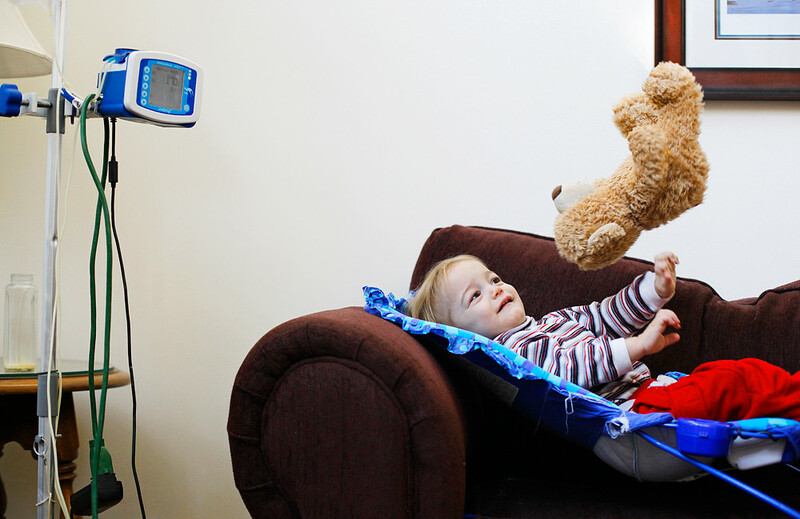 Joey Duffy, 18 months, throws a teddy bear in the air as baby formula is pumped into his stomach via a tube in his family's Springettsbury Township home on Wednesday, Nov. 2, 2011. The Duffy family lost electricity in their Springettsbury Township home during the snowstorm on Saturday, Oct. 29, 2011. Because their youngest son Joey is fed via a feeding tube due to esophogeal stricture, Tom Duffy purchased a generator in Dec. 2010 to power the feeding tube pump in case the house lost power. When their block lost power, the Duffy family rotated the generator to power Joey's feeding tube, the refrigerator and the house's heat in turns. When my editor and I looked over my takes from this assignment, she paused on this photo. “I am mesmerized by the floating teddy bear” was her comment. But we both knew this wasn’t a lead photo. Check out Teresa’s article to see what photo was main art and read more about the Duffy family’s situation. I wasn’t supposed to cover Penn State’s final home game. © 2011 by The York Daily Record/Sunday News. Surrounded by members of the media, Penn State tight end senior Andrew Szczerba prepares to rise after kneeling on the field after Penn State lost 17-14 to Nebraska in the Nittany Lions' first game in 46 seasons without former head coach Joe Paterno at the helm at Beaver Stadium on Saturday, Nov. 12, 2011. But things fall apart, and I was sent to State College on Friday night to cover the PSU Hope candlelight vigil and to stay through Saturday to cover the last home game of the season. Which was also senior day. Which was also the first game without Joe Paterno since 1950. Any game is a potentially emotional rollercoaster, and for four hours, the mood in Beaver Stadium fluctuated between contemplation, resilience, hope and sorrow. © 2011 by The York Daily Record/Sunday News. 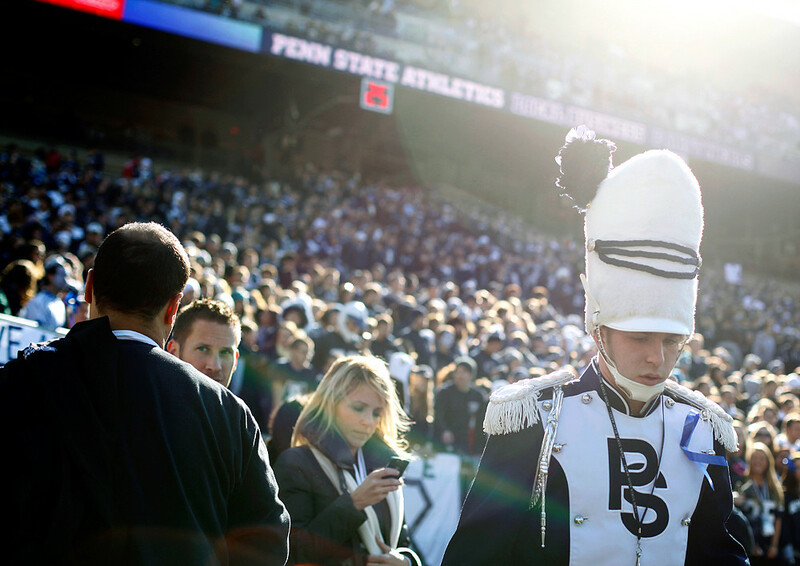 Blue Band drum major Ian Kenney, right, takes a moment to himself before the game. © 2011 by The York Daily Record/Sunday News. 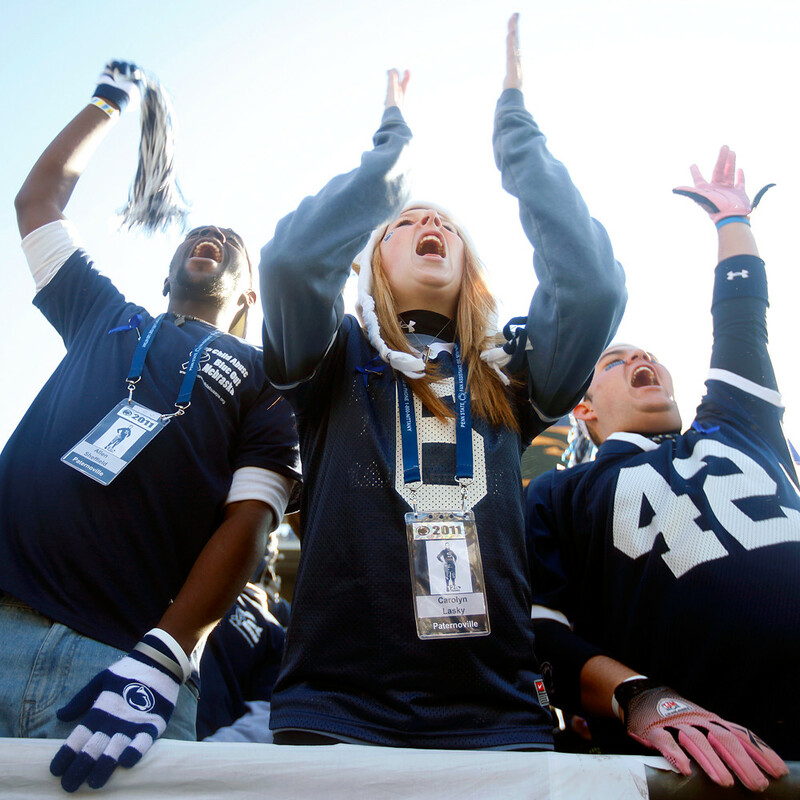 Penn State sophomore Allen Sheffield and juniors Carolyn Lasky and Troy Weller cheer before the players took the field. © 2011 by The York Daily Record/Sunday News. The ball rolls off of Nebraska fullback Tyler Legate's arm after Nebraska I-back Rex Burkhead had a fumble in the fourth quarter. © 2011 by The York Daily Record/Sunday News. 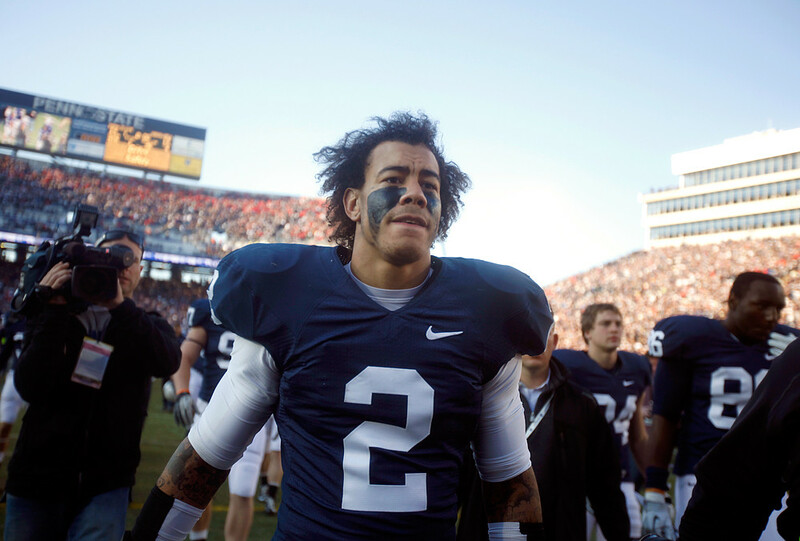 Penn State corner back and senior Chaz Powell leaves the field after Penn State lost 17-14 to Nebraska. © 2011 by The York Daily Record/Sunday News. Penn State senior and Blue Band silk member Kaitlyn Otto wipes tears from her face as the Blue Band prepares for its final home performance for the season after Penn State lost 17-14 to Nebraska. "I'm sorry; I'm a senior," Otto said to a photographer with an apologetic smile as her fellow silk members gathered to console her before their performance. Be sure to check out more photos that Jason and I made yesterday before, during and after the game. On Tuesday morning, Penn State seniors Kyle Harris and Jess Severs decided to plan a candlelight vigil in honor of the youth who were allegedly sexually abused by former defensive coordinator Jerry Sandusky. 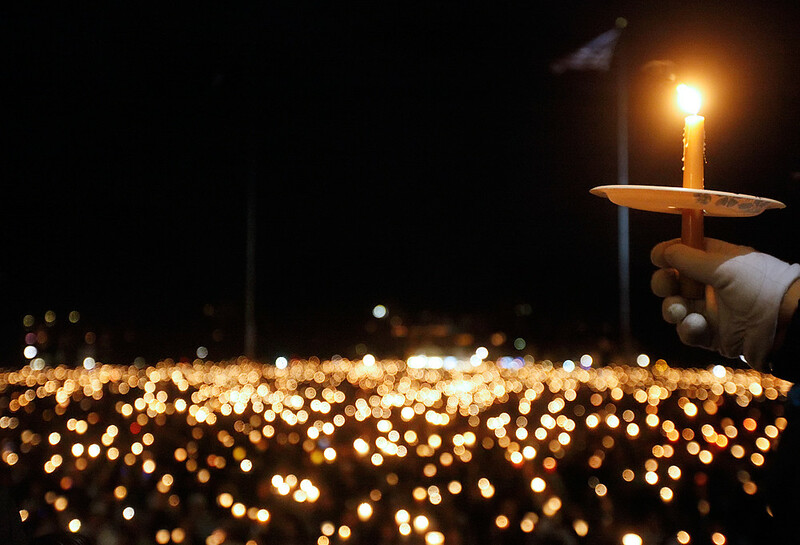 On Friday night, thousands of students, alumni, faculty and members of the State College community gathered for the vigil. © 2011 by The York Daily Record/Sunday News. 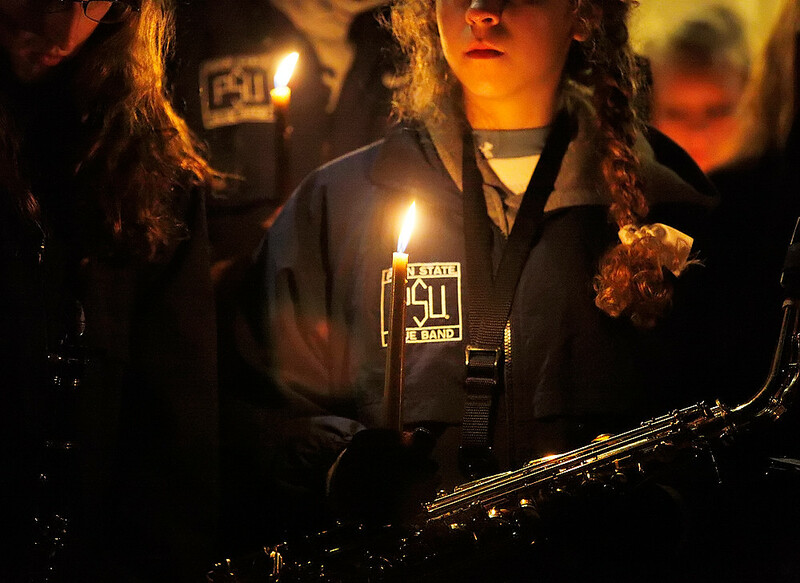 Penn State freshman and Blue Band saxophone player Molly Cain, right, holds a candle and her saxophone during the PSU Hope vigil on Friday, Nov. 11, 2011. Reporter Lauren and I were assigned to go to State College and find York County people to highlight for the article and photos. So that’s what we did. © 2011 by The York Daily Record/Sunday News. Blue Band secretary Ryan Bulgarelli, of Springettsbury Township, holds up his candle from the steps of the Old Main administrative building as the crowd chants, "We are Penn State" at the end of the PSU Hope vigil on Friday, Nov. 11, 2011. Be sure to read Lauren’s article, and to check out more photos. It’s Election Day Night! Godspeed to all my coworkers who are reporting, photographing, videoing and editing… and partying hard on Election Night food. © 2011 by The York Daily Record/Sunday News. York City Council candidate Manuel Gomez answers a question about how qualified female- and minority-led contractors can be given a fair chance for city projects at a forum hosted on Thursday, Oct. 13, 2011, at the Community Progress Council building. © 2011 by The York Daily Record/Sunday News. 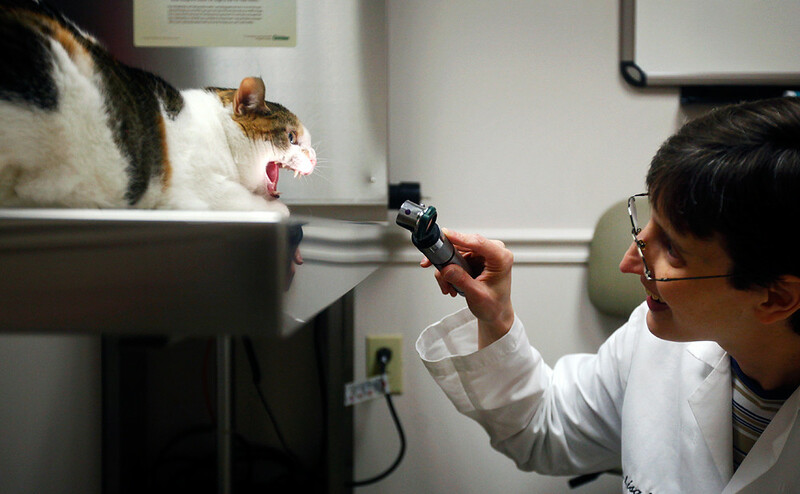 Patches, a 5-year-old cat belonging to Carol Bishop and her mother Mary of East Manchester Township, hisses at veterinarian Lisa Wade just as Wade asked her to open her mouth during a routine check-up on Friday, Oct. 28, 2011, at Shiloh Veterinary Hospital East. Carol Bishop said Patches wasn't very happy about going to the vet, and an assistant had to throw a towel over Patches' head and hold the cat in place while wearing welder's gloves as Wade gave Patches a rabies shot in the rump. Capital BlueCross is now offering insurance for pets through a partnership with pet insurer Petplan. My editor and I fought hard to get this photo on A1, but an unseasonal snowstorm that knocked out 44,000 York Countians’ power changed everything. C’est la vie in the world of daily news. 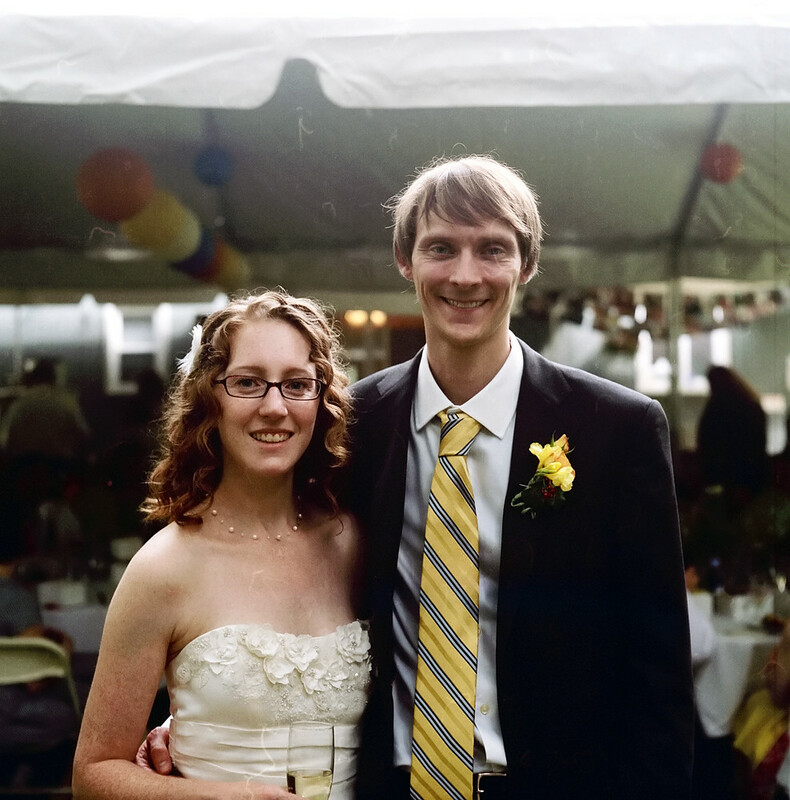 Erin and Scott are two nerds who got hitched in Erin’s parents’ backyard in mid-September. © 2011. Erin and Scott! Sorry for the dust on the film. Portra 400. Jeff, a few Missouri photojournalism alumnae and I attended. Naturally, we all brought our cameras. Naturally, I brought my Mamiya. © 2011. Erin and her parents enter the ceremony! Portra 400. It was a small, lovely wedding. © 2011. 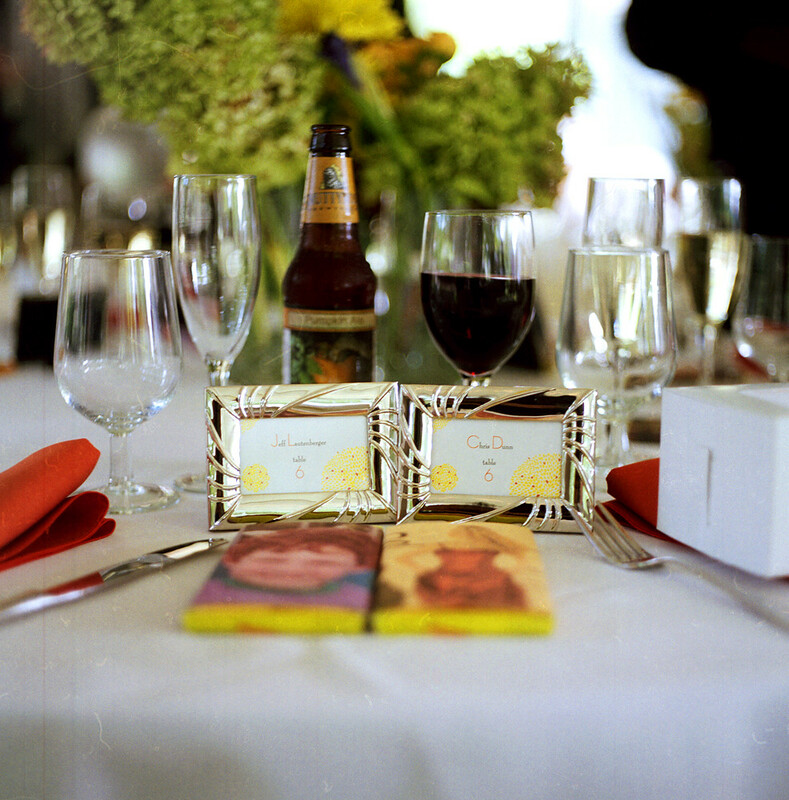 Jeff's and my places at our table under the tent. Portra 400. © 2011. 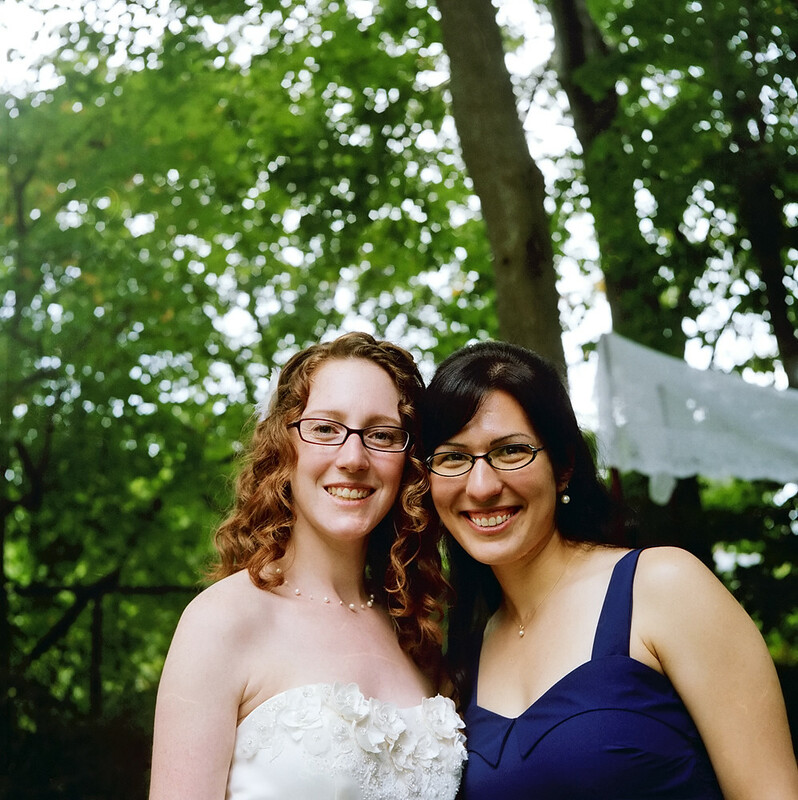 Erin with Kristen, one of the bridesmaids. Both were masters students at Missouri, and they're kinda nerdy. Portra 400. 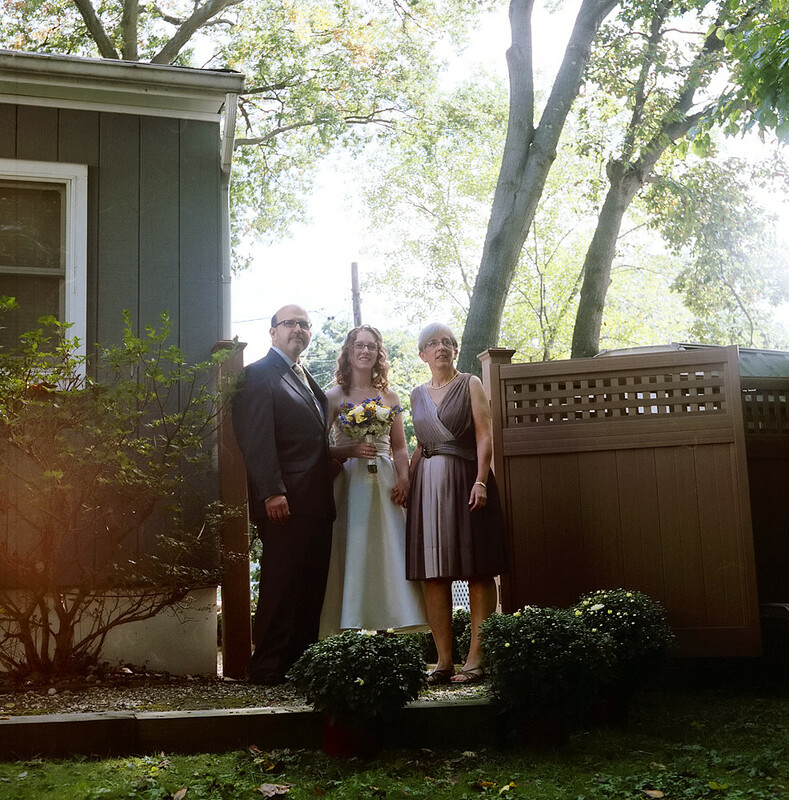 Thanks for sharing your lovely day with me, Erin and Scott! A (stray?) bullet hits a horse. But not just any horse. © 2011 by The York Daily Record/Sunday News. 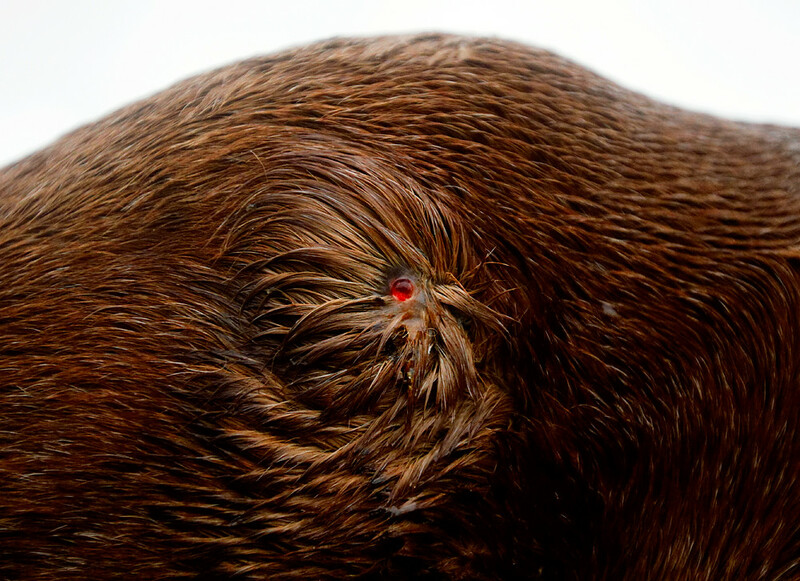 This photo shows the wound sustained by Witten, a 19-year-old Belgian horse owned by Amy Burkholder of Paradise Township, several days after he was shot in his right hindquarter while grazing on a Peach Bottom Township pasture on Sunday, Oct. 23, 2011. Burkholder said the muscular horse, who measures at 18 hands and is a retired Amish workhorse, probably felt the bullet as a bee sting and was still standing when she discovered the bullet wound the next day. Burkholder has owned Witten for about a year and said she cleaned the wound and expects the scar tissue to eventually push the bullet out. In posting this photo, I thought really hard to incorporate some Roy Rogers references — his dog is named Bullet, his horse is named Trigger and his song “Happy Trails” is a good-bye song — but I just couldn’t make it work. Maybe someone out there can help me out. Some girls completely dominated the guys in a shooting competition, which I think is pretty badass. 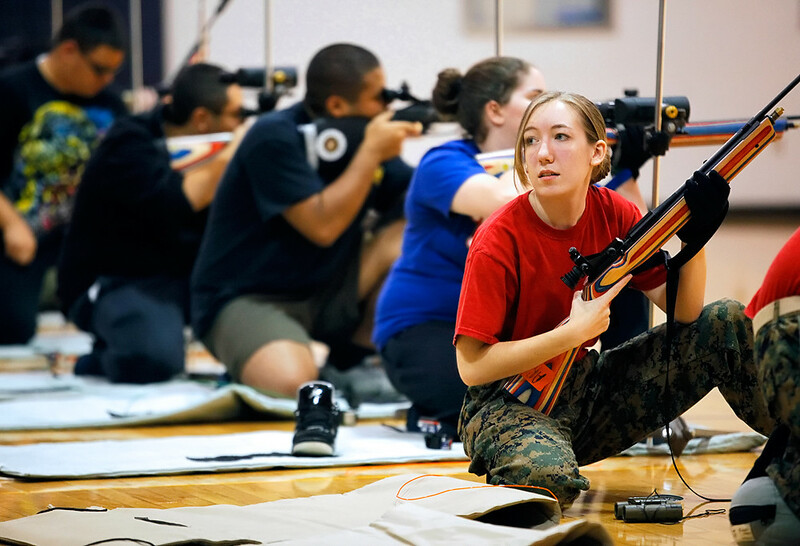 © Dallastown Area High School junior Amanda Arnold, also a corporal in the school's Junior Reserve Officer Training Corps, pauses to glance back while shooting an air rifle at the first annual Dallastown Marine JROTC Fall Shoot Out competition on Saturday, Oct. 15, 2011. JROTC students from Bensalem High School in Bucks County and a New Jersey high school competed against Dallastown students. Dallastown 1st Sgt. Matthew Corwin said he hopes to expand the competition and host more teams in future years. Seriously, check out the scores at the bottom of Lauren’s article (which you should read anyway). © 2011 by The York Daily Record/Sunday News. 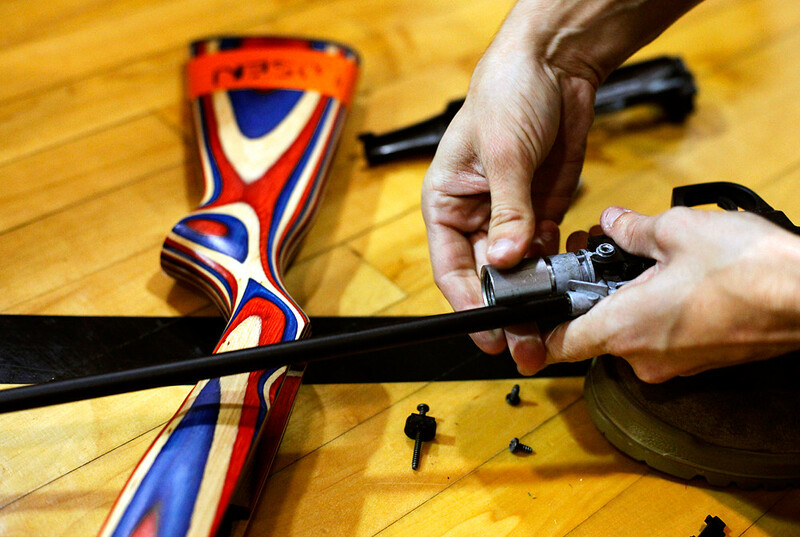 Dallastown shooting team assistant coach Gregory Zampier adjusts the airtube intake valve of an air rifle in need of repair at the first annual Dallastown Marine JROTC Fall Shoot Out competition on Saturday, Oct. 15, 2011.